For a number of years, the students from the Beacon School System and the community were having some problems that had racial overtones. It was during the winter and early spring of 1977 that, for several days and nights, racial problems became severe. The Sheriff’s department was called into the community to help bring the situation under control. A community meeting was held at the Howland Library with the following present: Edward Schuler, local legislators, Dutchess County Youth Bureau, Mayor Robert Cahill, the Beacon City Council, representatives of the clergy and also agencies involved with youth. The evening was spent discussing the cause of the problems and ways to possibly prevent them. Before the meeting closed it was decided to meet again, but in smaller groups, and to open the meetings to everyone. Victor Russo, a representative from the F.B.I.’s Community Relations, also attended the meetings and spent a great deal of time talking to people and youth on the streets of the community trying to discover ways that the problems might be resolved. At the smaller meetings, with representatives from the Mayor, City Council, Beacon School System, the Beacon Community Center (NSO), Howland Library, Chamber of Commerce, Dutchess County Youth Bureau, Concerned Citizens Group (Frances McNair), clergy and community people, lengthy discussions were held concerning the problem. One of the positive things to come out of these meetings was the creation of a “Community Day”. This was to be a day to bring the City together, especially the children and youth. All were in agreement that the community should get to know one another better, learn to know what each other liked in conversation, feelings, entertainment, education and food. It was now the month of May, almost June. Would there be enough time to get ready for a “Community Day”, and what would it be called? The group thought it could be held the last Sunday in September on Main Street. Several names were discussed and it was finally decided to it “Spirit of Beacon Day”. It was to be a day when everyone would come together and attempt a better understanding of each other and the entire community. In the fall of 1977, after a summer of planning, Seabury Lyons became Chairperson. The other committee members were: Patricia Hanna, Millie Melendez, Nan Whittingham and Barbara Verdesi. The group was committed to working together to make the first “Spirit of Beacon Day” a tremendous success! Booths featuring food, crafts and exhibits from local organizations and agencies lined Main Street. A stage for entertainment was set up on both South Brett Street and South Chestnut Street. A parade led by the Mayor and City Council marched down Main Street. The Committee had emphasized that all children and youth groups were welcomed to parade. They also stressed that it was not to be a day for politicking. Politicians seeking election were not to participate. Pat Hanna of the Howland Library served as Chairperson from 1978 – 1979. The next years saw more booths, more entertainment and more people marching in the parade. The day continued to grow and everyone was having a great time! 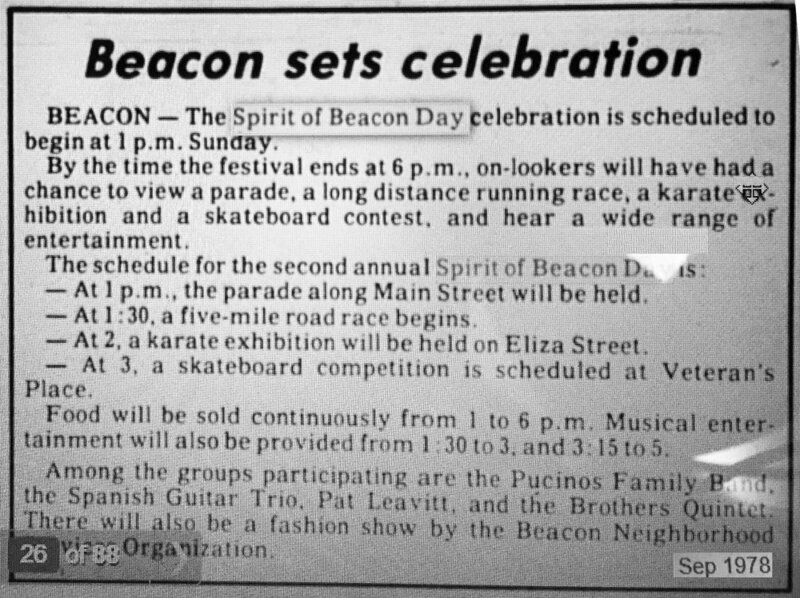 In 1978 and 1979 the Mayor and City Council felt that the Spirit of Beacon Day should be sponsored by the Commission of Human Relations. Community representatives were still to serve on the committee. In 1980 the City no longer became sponsors. Nan Whittingham, Director of the Beacon Community Center (NSO) chaired the committee from 1980 – 1984. In 1981 the highlight of the day was the presentation of a plaque to Pete Seeger from the Commission of Human Relations. The plaque was in recognition of all the work Pete had done for the City of Beacon. In 1985 Ray Lantiqua became Chairperson, followed by Gladys Bettina and then again by Nan Whittingham. Rose Story chaired the event from 2001 -2017, with Roy Ciancanelli coordinating the Parade . In 2018 new volunteers joined the committee to help carry the torch and tradition forward. As the years have gone by, the Spirit of Beacon Day has become a time that everyone looks forward to- a day to come together in unity and spirit!